Stinging Nettle is the common name for this herb. It grows thick along the stream banks and in shaded areas of most temperate climates including Europe, China and North America. 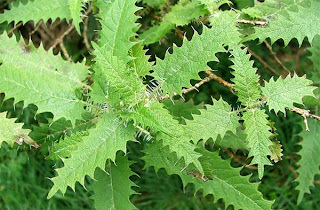 The plant has dark green leaves with bristles that transfer irritating chemicals on contact, thus the name Stinging Nettle. When the plant is cut and air dried, the stinging principles degrade substantially and the plant can be used as a medicinal herb. Nutrients: This herb is very high in many nutrients including calcium, chromium, cobalt, magnesium, manganese, phosphorus, potassium, protein, riboflavin, selenium, silicon, thiamine, vitamin A, vitamin C, and zinc. Nettles is a fantastic remedy for all inflammatory and mucous forming conditions. Allergies, asthma, bronchitis, eczema, psoriasis to name a few. Nettles is a blood purifier. Because of this, it is known to increase the efficiency of liver function. Another great blood purifier is Red Clover. Nettles has diuretic properties which increases the production of urine. It has been known to increase the efficiency of kidney function. Nettles has been included in hair tonics for centuries due to its purported ability to stimulate hair growth. I actually have a friend at work that swears this is true. She used Nettle leaf for a period of time and now has nice thick hair. Nettles also has an effect on the respiratory system treating asthma and bronchitis. Add a little of this herb to any smoothie recipe. For some ideas check here and here. Make a tea or strong decoction of this herb. I recently added Nettles to a tea mix that I am drinking while pregnant. There are so many great nutrients in this herb that it will help nourish the baby and I during my pregnancy. You could probably find this herb at any local herb store. I purchased mine online at Mountain Rose Herbs. For more ideas on how to soothe seasonal allergies check out my post on Bach Flower Remedies and Homeopathics. I regularly drink nettle tea... It's earthy and nourishing.